In a previous article, I explained what is and how it works DMVPN technology. In this article you see how to configure DMVPN phase3. This phase allows spokes to build a spoke-to-spoke tunnel and to overcomes the phase2 restriction using NHRP traffic indication messages from the hub to signal to the spokes that a better path exists to reach the target network. Allow a single GRE interface to support multiple tunnels, simplifying the size and complexity of the configuration. Note: The MTU is set to 1400bytes due to GRE and IPSEC overhead, while the maximum TCP MSS is 40 bytes lower than the MTU (20 bytes IP header + 20 bytes TCP header). Remember: The tunnel key-id is used as a form of weak security to prevent improper configuration or injection of packets from a foreign source. The key must be the same in all tunnels. Allow spokes to be deployed with dynamically assigned public IP addresses (i.e., behind an ISP’s router). The hub maintains an NHRP database of the public interface addresses of the each spoke. Each spoke registers its real address when it boots; when it needs to build direct tunnels with other spokes, it queries the NHRP database for real addresses of the destination spokes. Note: The “ip nhrp map multicast dynamic” command allows NHRP to automatically add spoke routers to the multicast NHRP mappings when these spoke routers initiate the mGRE tunnel and register their unicast NHRP mappings. This is needed to enable dynamic routing protocols to work over the mGRE tunnels between the hub and spokes. The command “ip nhrp map 10.0.1.1 17.17.17.1” configure a static mapping IP-to-NBMA of the HUB router, while the command “ip nhrp nhs 10.0.1.1” define the ip address of the next-hop server (hub). These commands are required on spokes routers. Remember: The authentication string, the holdtime and network-id must be the same in all tunnels. 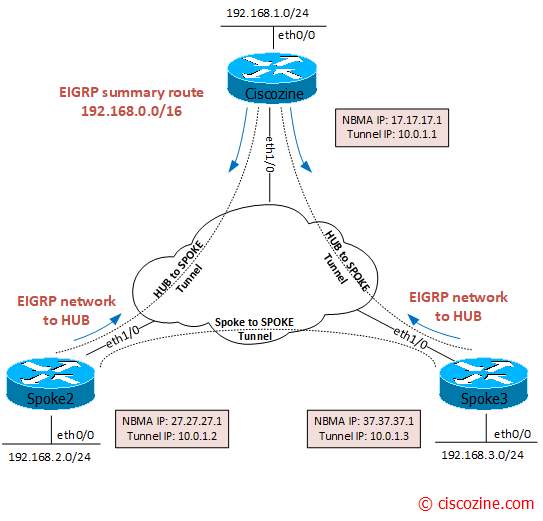 Learn networks between hub and spokes. The key chain is used to authenticate EIGRP process; obviously, it must be the same on all routers. At the end of this step, the DMVPN is operational and can be used but, my suggestion, it is to complete the DMVPM architecture encrypting and protecting all data with IPSEC. The last step (optional) is to protect the mGRE tunnel with IPSEC. To do it, you need to define an isakmp policy/profile and a ipsec transform-set/profile. Now the architecture is complete and protected by IPSEC. DMVPN phase3 allows spokes to build a spoke-to-spoke tunnel and to overcomes the phase2 restriction using NHRP traffic indication messages from the hub to signal to the spokes that a better path exists to reach the target network.